There quite a few tanks hitting the market that are touting versatility. The Rage 3-in-1 and the EHPro Morph Tank spring to mind. The tank that does not spring to mind and is, in fact, rarely mentioned outside of Eastern Europe is the Sapphire. Sad, because this is one heckuva setup! I purchased this tank with my own greenbacks from FastTech, and it is a "styled" clone. Neither of those tidbits of info are going to skew my review. I will note here that I have been unable to find an authentic for sale. Everywhere that has listed an authentic shows it as sold out. But what is it? That's kinda hard to explain because it's an RDA and it's an RTA. The best of both worlds, and I do mean the best of... As an RTA, it's a four post deck with wide open bottom airflow similar to that on the Goblin V1.2 or Zephyrus. It's maybe a bit more open than either of those, though. And, the deck is bigger, too. As an RDA, it's the same deck and airflow and the e-liquid is dripped around the outside of the deck, and is wicked up to the coils. This allows for as much e-liquid as some of the best RDAs on the market. Not as much as, say, the Twisted Messes, but lots more than the Pi2 or Kennedy. 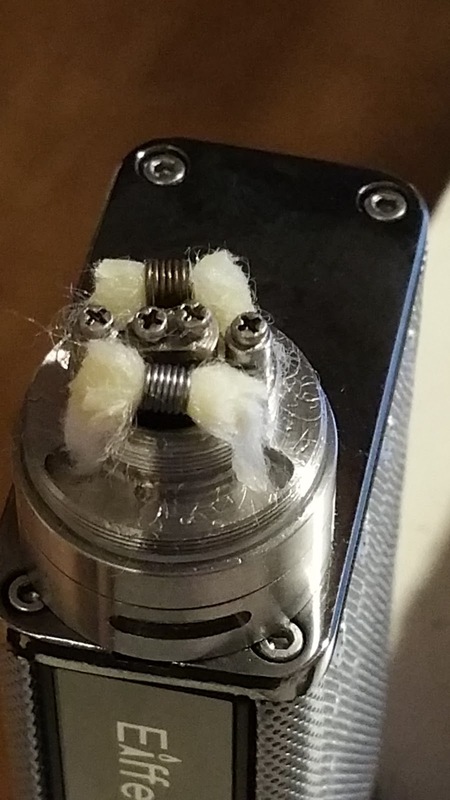 Speaking of Kennedy, since the deck is a pretty standard RTA deck, the airflow comes from under the coils... much like the Kennedy or Fishbone. There is no side airflow, so a comparison cannot be made with the Mutation X V4 (which features dual airflow - side and bottom). 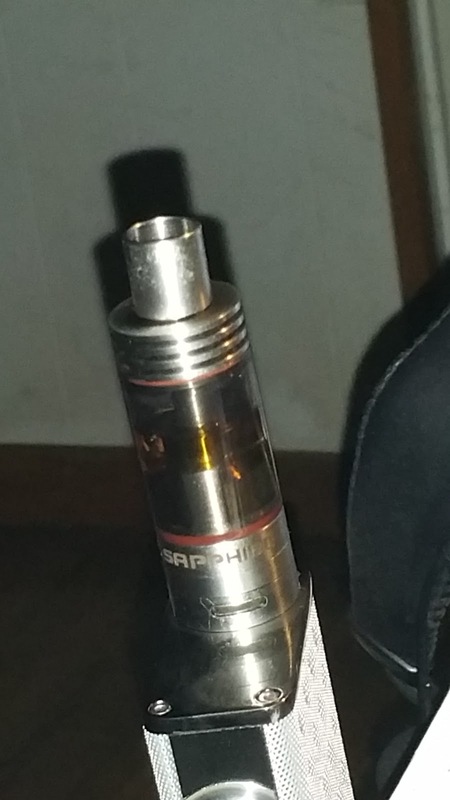 Both the flavor and the clouds off of this device are above average in my opinion. In the box is the tank with an attached wide bore stainless steel 510 drip tip, a set of spare o-rings and screws (Phillips head), another blue screwdriver to add to the collection (although this one was closer to a seafoam green), and the RDA adapter with a frosted plastic chuff cap. That's it... no extra glass. The tank measures 54.75 mm tall excluding the 510 and drip tip, and is 22 mm in diameter. A little tall, but not huge by any stretch. In RDA mode, it is 47 mm tall, including the chuff cap. From the top of the tank down, there is the drip tip. It's a short, wide bore affair held in place with a single o-ring. I have been able to use almost every drip tip in my collection in on this tank. Under the drip tip is a fairly large four-finned heat sink. The fins are the same diameter as the tank. Beneath that over-sized heat sink is the glass tank. The glass on mine is smoked and there are red o-rings at the top and bottom. The glass is held in place by the cage - reminiscent of the cage in a UWell Crown Tank - which screws onto a chimney connected to the heat sink above. The entire thing can be disassembled by unscrewing the cage and popping the glass out. Beneath the stainless steel ring that is the exterior of the cage - and where the single piece of visible engraving is located "SAPPHIRE", is the deck which has it's own removable barrel. Beneath that, the airflow control ring. There are no set stops in the adjustment of the airflow, and the ring rotates freely, but not loosely. There are grooves cut into either side of the ring to help you move it. I leave it wide open. Beneath the airflow ring, around the 510, are the only other engravings "Original by KEPLER" and a serial number. The 510 features a copper center pin and appears to be adjustable. I still would not use this on a hybrid mod, though. Building on the Three-post, four-hole deck is as easy as building on any such deck. The post-holes are 1.5 mm in diameter and will support large wires and Clapton builds with ease. I was able to easily fit 22 gauge wires and a 34/24 fused Clapton in there. The fused Clapton build was tight, but doable. 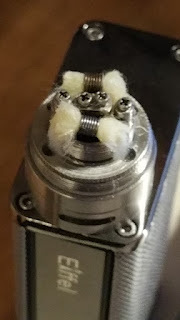 I would not run a fused fused Clapton on this deck, as it is a dual coil only deck and it would produce a lot of heat. But, it's nice to know the option is there if I ever need to go crazy with it. 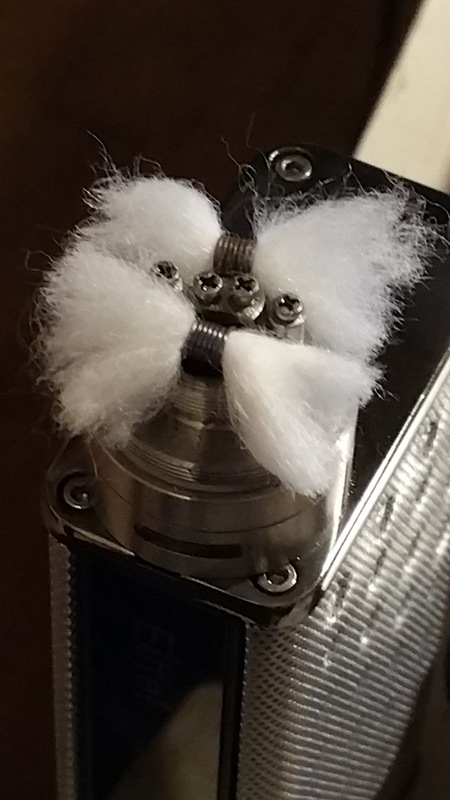 Wicking is very easy. There's a wick retaining ring with four slots cut out that correspond to the four juice channels. Trim the wick to sit down in the juice channels and thin enough that the retaining ring fits over it and it's done! Set up this way, the tank wicks very nicely. 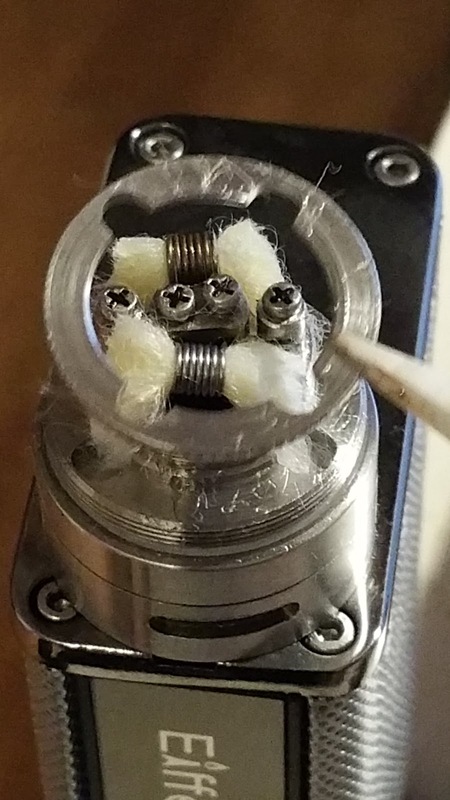 At 45 watts on a .38 build (7 wraps of 26 gauge Kanthal A1 on a 2.4 mm screwdriver), I was able to vape through three 5 ml tanks in 2 days and never suffer a dry hit. Even when chain vaping, the device kept up! I rarely experienced any kind of leaking. Rarely... Once I mopped up some condensation, and once - when in dripper mode - I seriously overdripped right onto the coils. 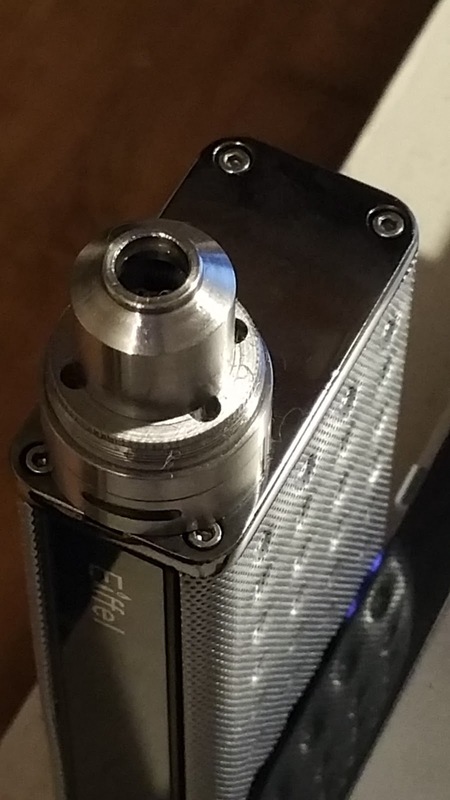 Switching to RDA mode is easy even when the tank is full. 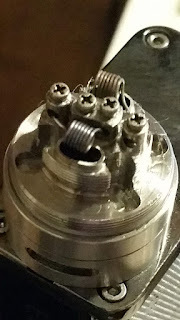 Invert the tank, remove the top, remove the build deck's barrel, and screw on the RDA section in place of the tank. 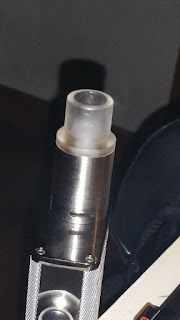 The frosted chuff cap is held in place a little loosely with a single o-ring, so dripping into the RDA's barrel with the chuff removed is very easy. I do not recommend dripping into the chuff cap as that is how I managed to get the leaking mentioned above. Would I replace this if I lost it. Yep! I would be hard pressed not to. After all, this is an easy to use, easy to switch rebuildable tank atomizer and rebuildable dripping atomizer in one for around $20. That's value! It's not perfect, though. I would like to see a better o-ring on the drip tip and the chuff cap, a spare glass in the kit, and maybe even a drip tip adapter to accompany the chuff cap. Finish 10/10 - Thus far, I’ve encountered no rough spots on the threads or the glass. The device was clean and free of oil. There were no metal shavings anywhere. Form 9/10 - Although it's tall, it holds 5 ml and looks quite nice. Even with the large heat sink... 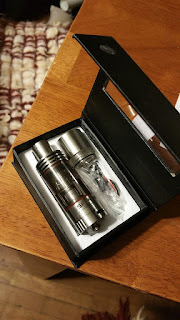 I would like to see a spare glass section, and a drip tip adapter along with the chuff cap. Tighter o-rings on the drip tip and chuff cap would also be nice. Function 10/10 - As an RTA, it is as good or better than most any other tank I own. The UD Bellus and Aromamizer might beat it a bit, but only a bit and only because of the two-post deck. As an RDA, is is easily bested by several other devices in either flavor OR vapor, but holds its own against most in terms of flavor AND vapor. Final - 9.7/10 - A very solid A+ grade!